Like and Follow Me on Facebook to connect with me, see exclusive Facebook-only webinars, Q&A’s and to get exclusive deals and offers I only provide to my FB followers! Join my Divi Facebook Group! 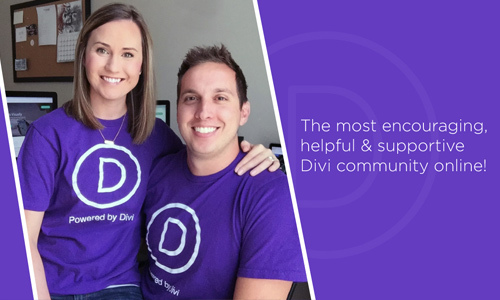 Join my Divi Web Designers Facebook group to get free support and to be automatically plugged into an awesome, supportive community of fellow Divi/WordPress web designers! I offer exclusive discounts and deals to my email list and promise not to abuse the privilege to email you directly. No spam. Just special deals, important announcements and a notification when a new tutorial or video goes live! Just an FYI - Divi is a registered trademark of Elegant Themes, Inc. This site isn't affiliated with or endorsed by Elegant Themes.